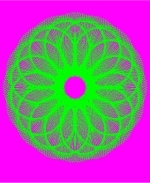 Artwork based on Hypotrochoid curves first became popular from the lates 1960's onwards with the release of Spirograph®. A Spirograph® set consists of a number of plastic gears and other shapes such as rings and straight bars. A pen placed through one of the holes in a gear piece will trace a curve as it moves against, and is constrained by, one of the other shapes. 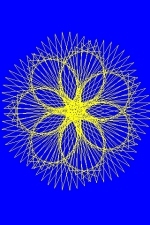 One set of curves that can be produced using Spirograph® are known as Hypotrochoids. 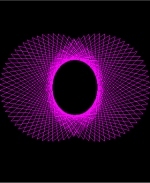 2 Programs to generate Hypotrochoid curves, are now available for the Apple iPhone and iPod Touch. These are available as Trocs and Trocs LITE. 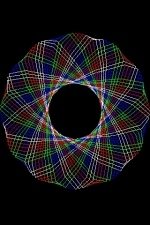 Curves, are created by tracking a point associated with a circle which is rolling around the inside of a larger circle. 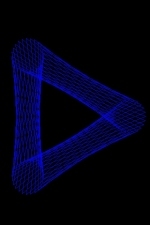 The point may be inside or outside the moving circle but remains fixed relative to the moving circle. 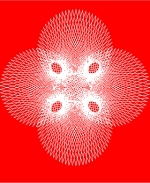 Why not have fun creating your own hypotrochoid artwork with one of these programs. 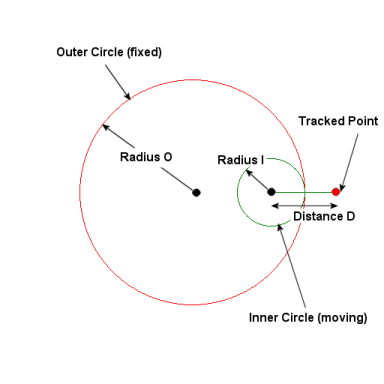 A hypotrochoid is a roulette traced by a point attached to a circle of radius I rolling around the inside of a fixed circle of radius O, where the tracked point is a distance D from the center of the moving circle. 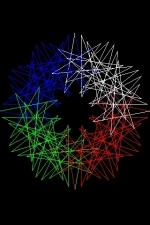 P defines the number of points to compute for each cycle (revolution) of the moving circle around the outer circle (for example, a value of 4 would generate a point at 90 degree intervals). 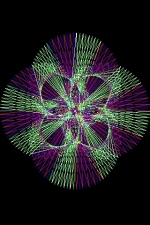 2 programs are available from the App Store that enable you to explore the artistic possibilities of the Hypotrochoid. The "View" page has options to "Draw" the curve as the Inner circle is moving along the outer circle, "Reset" will return to the default Troc and "Random" will generate a Troc by selecting settings by random". 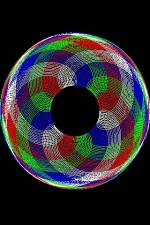 Trocs allows the user to generate their own hypotrochoid artwork by simply modifying values, by moving the sliders, for the outer circle radius (O), the inner circle radius (I), the distance (D) and the number of points per revolution (P). These values are modified on the "Settings" page. 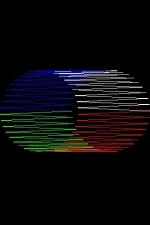 Colors are modified on the "Colors" page. 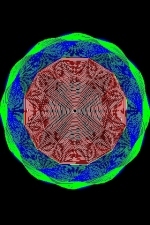 The user can choose a color for the background and a different color for the curve. You can return to the default Troc at any time by shaking the device. 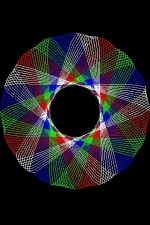 Curves are drawn using 4 colored pens Red, Green, Blue and White simultaneously for different portions of the curve, to enhance the artistic appearance of the finished artwork. Redraw is used to draw the current curve, Info will detail the current parameters being used and Random will generate a new curve. Both applications support standard controls that include the ability to zoom in to or out of the picture by using a "pinch" gesture on the screen and to move the picture about on the screen by moving your finger on the screen. Double tap on the screen to automatically center and zoom out to view as much of of the artwork as possible. 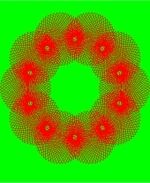 These commands also force completion of the drawing of the curve while the curve drawing is in progress and can be used as an interrupt. To take a screen shot hold down the home button and then push the top button. The screen will flash and the resulting image will be placed in the Saved Photos section on your camera roll. This works for both the iPod Touch and iPhone.